Self-driving cars are changing our means of transportation. Access that theme with these ETFs. Disruptive technologies are permeating everyday life, including how drivers access and purchase transportation. Fortunately for investors looking to access tomorrow’s disruptive themes today, there are myriad avenues for participating in the inevitable boom in self-driving cars. While it remains unclear just how many drivers will embrace self-driving cars, there are implications for the broader transportation industry. In varying ways, exchange-traded funds (ETFs) can help investors participate in the self-driving car revolution. With that said, here are some self-driving car ETFs to consider. 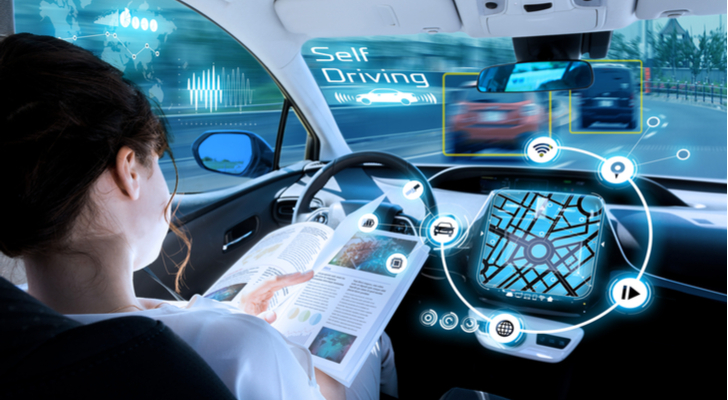 The Global X Autonomous & Electric Vehicles ETF (NASDAQ:DRIV), which debuted last April, offers investors exposure to various areas of the self-driving car arena. DRIV, a thematic ETF, holds 75 stocks, none of which exceed weights of 3.81%. Well-known names in this self-driving car ETF include Apple (NASDAQ:AAPL) and Microsoft (NASDAQ:MSFT). The KraneShares Electric Vehicles & Future Mobility ETF (NYSEARCA:KARS) is one of the original self-driving cars ETFs, having debuted last January. KARS taps into the self-driving cars and electric vehicle investment ideas along with related, downstream ideas. The fund’s underlying index “includes issuers engaged in the electric vehicle production, autonomous driving, shared mobility, lithium and/or copper production, lithium-ion/lead acid batteries, hydrogen fuel cell manufacturing and/or electric infrastructure businesses,” according to KraneShares. While self-driving cars make for a compelling investment thesis, the exposure to electric vehicles offered by KARS is, for now, more tangible and arguably more compelling. Electric vehicles are here and are being purchased in increasingly large numbers. By 2040, more than half of new car sales around the world will be electric vehicles. The ALPS Disruptive Technologies ETF (NYSEARCA:DTEC) has recently appeared in this space several times. DTEC is not dedicated to self-driving cars, but the fund does offer exposure to that theme and many others. DTEC features equal-weight exposure to 10 disruptive technological themes, including clean energy, artificial intelligence and robotics, data and analytics and Internet of Things (IoT), all of which have some exposure to autonomous and self-driving cars. Most of DTEC’s 100 holdings can be considered growth and momentum stocks, which explains why the fund fell out of favor last month. However, the fund has recently shown signs and a move above $27 could be encouraging on a technical basis. The Innovation Shares NextGen Vehicles & Technology ETF (NYSEARCA:EKAR) was the second self-driving cars ETF to launch in the U.S. EKAR targets the Innovation Labs Next Generation Vehicles Index. That benchmark features exposure to makers of autonomous vehicles as well as “new energy vehicles” or electric vehicles. EKAR holds 75 stocks, including Tesla (NASDAQ:TSLA), Alphabet (NASDAQ:GOOG, NASDAQ:GOOGL) and Nvidia (NASDAQ:NVDA). “By 2025, 80% of the top 20 OEMs are planning to have at least Level 4 automation, so cars can fully drive themselves in most situations with hardly any human intervention,” according to ETF Trends. One of the newer additions to the fray of alternative and clean energy ETFs, the ALPS Clean Energy ETF (NYSEARCA:ACES) has some credibility as an electric vehicle fund with some exposure to the self-driving car theme. ACES is a novel approach to investing in clean energy and one that could potentially prove more efficacious than traditional alternative energy ETFs over the long run. The fund features exposure to seven alternative themes, including solar, wind and electric vehicles and storage. “Electric vehicles are also a key catalyst for the expansion of energy storage technology like lithium batteries, although energy storage more broadly includes a host of other emerging technologies,” according to ALPS. ACES is up 4.30% this month. The First Trust NASDAQ Global Auto Index Fund (NASDAQ:CARZ) is one of the original automotive ETFs so this fund is heavily rooted in traditional auto manufacturers such as General Motors (NYSE:GM) and Ford (NYSE:F). Those companies and others are looking to bolster their self-driving car footprints. An issue for CARZ is that it is a heavily global fund. Just 24% of its holdings are U.S.-based companies, meaning it has been stung by the White House’s tariff gambit as highlighted by a year-to-date decline of nearly 20%. The SPDR Kensho Smart Mobility ETF (NYSEARCA:XKST) is highly levered to the future of transportation, including self-driving cars. XKST, which turns one year old in December, tracks the Kensho Smart Transportation Index. That benchmark “includes the areas of autonomous and connected vehicle technology, drones and drone technologies used for commercial and civilian applications, and advanced transportation tracking and transport optimization systems,” according to State Street. XKST holds 55 stocks, about a third of which are companies engaged in making automobiles or automotive parts. Tesla is XKST’s second-largest holding. An advantage offered by XKST is that while the fund is a thematic fund, its approach spans beyond self-driving cars, offering investors some diversification beyond what is still a narrow investment niche. Article printed from InvestorPlace Media, https://investorplace.com/2018/11/7-etfs-for-the-inevitable-boom-in-self-driving-cars/.